A weak USD and NAFTA hopes pushed USD/CAD down. 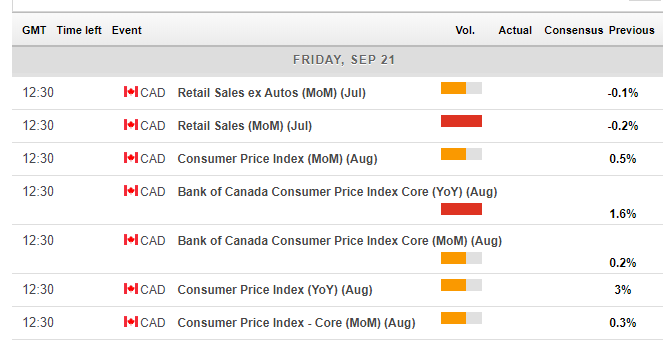 Friday’s Canadian inflation and retail sales numbers stand out. The technical picture is mixed for the USD/CAD. Mexican Negotiator Ildefonso Guajardo expressed optimism about Canada joining the deal between the US and Mexico, helping the loonie advance. On the other hand, Mexico may be willing to settle for a bilateral agreement with the US. Perhaps more importantly, the US and Canada continue negotiating without any deadlines. The loss of interest by the media helps the C$ recover. The thorny issues remain arbitration (Article 19) and also dairy products. Canada’s Prime Minister Justin Trudeau reiterated that no deal is better than a bad NAFTA deal. US Secretary Steven Mnuchin is leading an effort to strike a deal with China. The news improved the mood and weighed on the US Dollar. However, it is unclear if he has the backing of Trump. Canadian figures have been mixed with a miss on Housing Starts and an increase in the New Housing Price Index. The US inflation report disappointed on all measures. Core Consumer Price Index decelerated from 2.4% to 2.2%, weighing on the US Dollar and giving the USD/CAD another kick lower. Top-tier Canadian events are released simultaneously on Friday at 12:30 GMT. Inflation reached a high level of 3% YoY in July while Core inflation lagged behind with 1.6%. The divergence stems from an increase in energy prices. We may see lower levels on both monthly and yearly numbers in the publication for August. The second report is retail sales for July. Despite being a late figure, it can steal the show from the inflation report. Canadian shopper disappointed in June by decreasing their spending by 0.2%. Core sales slipped by 0.1%. We could see a rebound in the report for July. Until Friday, any NAFTA-related news will be of high interest and even on Friday, when top-tier figures are due, trade developments will likely overshadow the data. Reports about a breakthrough will push the Canadian Dollar higher while if we hear about a crisis, the loonie could feel lonely against. Building Permits and Housing Starts are due on Wednesday. If they both head in the same direction, the US Dollar will move. In quite a few past publications, the figures offset each other. 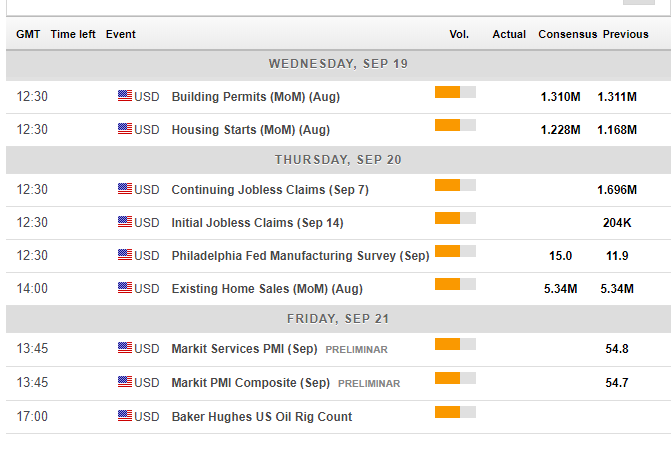 The Philly Fed Manufacturing Index is due on Thursday. The number dropped sharply in August and could recover now. Existing Home Sales saw four consecutive drops as of the report for July, the worst since 2013. The fifth drop in August will be worrying. 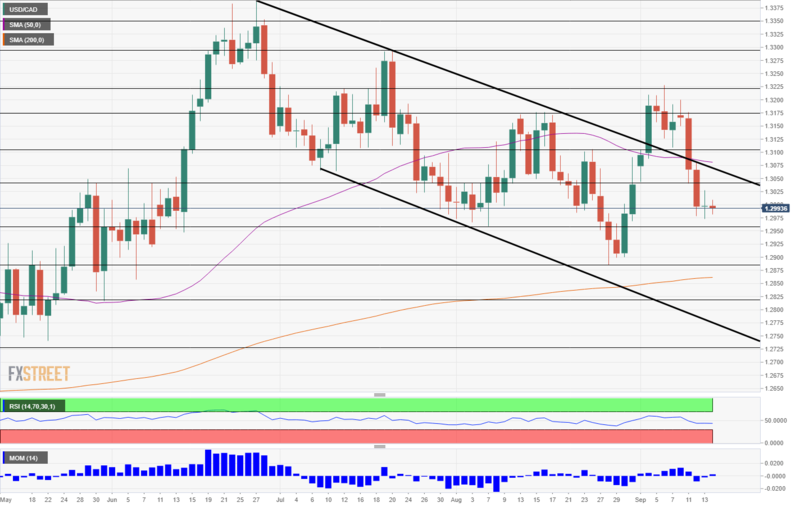 The USD/CAD fell back to the long-term broad downtrend channel after leaving it for merely a week. The pair also lost the 50-day Simple Moving Average but remains above the 200-day one. Momentum and the Relative Strength Index are going nowhere fast. All in all, the picture is now balanced. 1.3045 temporarily capped the USD/CAD in August before switching to support. 1.3100 is a round number and also supported the pair when it traded on high ground in early September. 1.3175 held it down in August and 1.3220 was a peak in both September and July, giving it more importance. 1.2960 was a low point in August and the USD/CAD got close to it back in early September. 1.2880 was the trough in late August. Lower, 1.2820 was a stepping stone on the way up in late June. We are unlikely to see a trade deal in the upcoming week. As negotiations are not close to conclusion, the focus is on domestic data and trade between China and the US. The favorable mood that the loonie enjoyed this week is unlikely to last. All in all, there is more room to the upside than to the downside for the USD/CAD. The FXStreet forex poll of experts provides interesting insights. Previous ArticleBitcoin Cash price analysis: BCH/USD bulls lose balance at $470, what could be next? Next Article When are the US retail sales and how could they affect EUR/USD?